Behind the stunning artistry of Duel of Ages lies an epic, deeply intriguing strategy game that will capture your attention for years to come. Build the uniquely modular game map (using the PAKIT board game system) to your own advantage, thwarting the enemy's attempt to do the same. 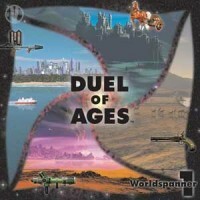 Add a Review for "Duel of Ages"